Oh how I love Makenna and the pink kitchen note cards and that fancy Martha Stewart punch!! 'Nuff said! BTW - have you seen the new and improved A Muse News blog?? Go check it out, and be sure that you register for the newsletter - it's going to be new and improved, too!! Ch-ch-ch-changes!! 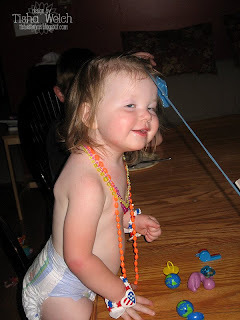 Or - "It's all fun and games until ..."
Last week we got a box of goodies from a friend - think Carnival prizes - and before she gave it to me she asked if my kids were allowed to have those sticky wall walker things. Sure, why not, I said! The kids had a blast digging into the box ($2 worth of c-rap provided us with at least an hour worth of fun!)! 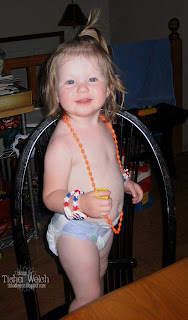 First Parker (3) & Lily (1 1/2) tried on all the jewelry. 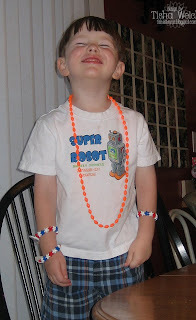 Is he cool or what?? 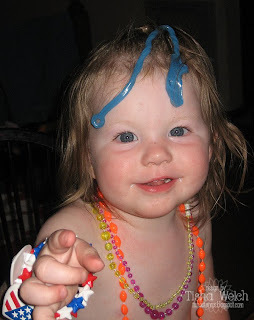 It's all fun and games until you get your wall walker thing stuck in your sister's hair! Just playing with the new A Muse Peace and Cheer Clear stamp set and kit! Have you gotten yours? 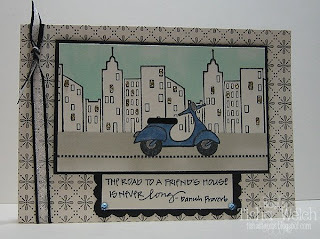 Are you playing along in the free My Creative Classroom class with the amazing Julie Ebersole?? No - well, what the heck are you waiting for?? Details: All stamps, note cards, ribbons contained in the Peace and Cheer Clear Kit. 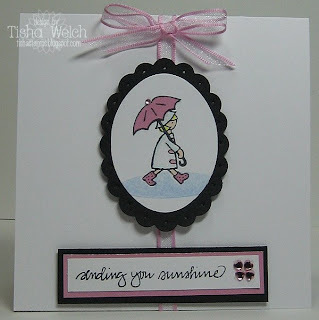 A Muse Addicts Stamps of the Week! The amazing A Muse Addicts site turns ONE! this week!! I can't believe that it has been a year! If you aren't a member - check it out here! Every week, they pick a "stamp of the week" - this week, they picked 4!! Apparently, I got confused ... and made this, thinking to myself the whole time - "look at me, participating in a challenge, making a card on time!" Except I used the wrong stamp!! Oh well - I'll try again! Details: Stamps, note card, paper, ribbon, twinkles by A Muse, black CS from my stash, colored with Copics. I came up with a kind of "wallet" template, and used this pretty SEI double sided paper to make it! 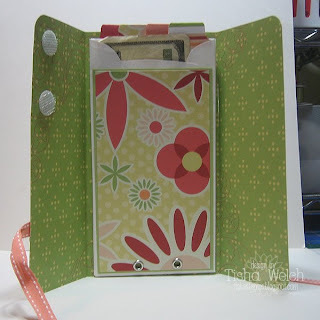 My measurements were based on the SU open ended envelopes that I put on the inside. The whole thing closed with ribbon and 3 velcro closures. Don't you think the the A Muse Shopping Gal is appropriate? There are 4 tabs across the top, made with the SU tab punch. So, the envelopes are made, now I just have to work on staying on the budget! 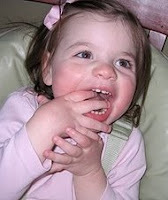 It's Friday - must be time to catch up on Heather's Share Your Spark from last week!! She challenged us to make something for the Holidays now! Easy, smeezy with all the amazing new stamps from A Muse!! 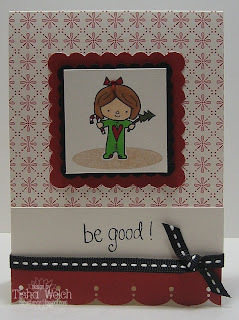 Cute new Cindy Lou, sentiment from the new clear Sentiment set, and the new Swiss Red Vintage Paper (love it!!)!! Do you see those pretty snowflakes in the background? 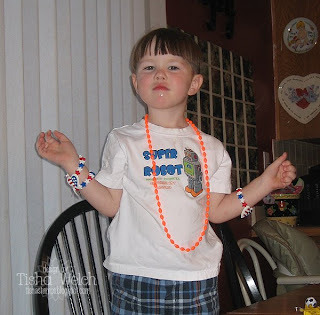 Those are in the awesome Peace and Cheer Kit available here! I'm planning all kinds of things with those! Details: Stamps, papers, ribbon, twinkles by A Muse, colored with Copics. turned 3 years old a couple of weeks ago. and had a great party with cupcakes and fun at the park! I made her gift after being inspired by Ali Edwards here and Michelle Clark here! I think the hardest part of this project was covering the mat with the paper. 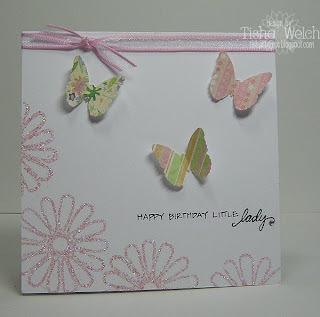 I used some of the pink Prism sparkly cardstock. The mat was longer than 12 inches, so I had to get creative. It worked pretty well to just miter the corners (lay both square pieces over each other, then use an exacto knife and a straight edge to cut through both at an angle). 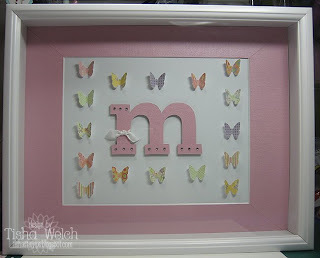 The butterflies are punched out of the tag pieces in the Basic Grey Oh Baby Girl! 12x12 paper pack! The scale on the tags was better suited to the punch than the bigger paper. 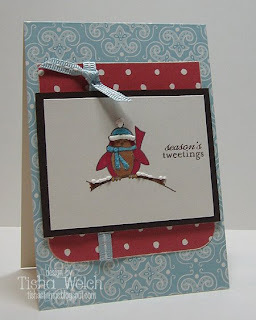 And I had enough left over to make a card, too!! Details: Stamps (Gerber Daisy & Happy Birthday Little Lady) by A Muse, ribbon, twinkle stickers by A Muse, punch by Martha Stewart, patterned paper by Basic Grey. Post a comment on the original post on the AMAP blog with a link to your card and you could win an amazing prize!! I'm not 100% in love with this one ... I was going for something "different" with the scallop oval clear creative candy, so I thought they kind of looked like lanterns (??? maybe, just a little bit??) I think it works, but it just seems a bit "flat" or something! I probably should have drawn in the top of the lantern to give it a bit of dimension! Oh well - it is what it is!! FYI - punching your creative candy with a hand held punch is kind of a bad idea - punch paper, not big pieces of plastic!! Details: A Muse stamps, papers, creative candy clear stickers and twinks! Helle ( the big winner from last year's A*Muse*A*Palooza and now the co-owner of Paper Tales in San Diego - I know, I'm trying to keep my jealousy to a minimum! ), had this awesome color challenge for A*Muse*A*Palooza last week! Black, white, a little pink and some bling! Love it! This came together super quick - I paper pieced the hat and boots, then smacked myself in the face 'cause I had spent so much time cutting out a SOLID color! Oh well, it gave little Miss Seattle Girl a bit of dimension! Details: Stamps, paper, ribbon, twinks by A Muse. How well did you know me?? 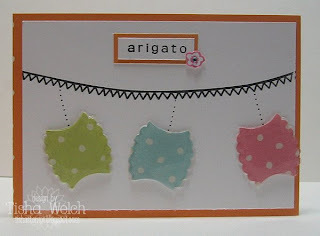 Last week on the A*Muse*A*Palooza blog, you were asked to match the designers to their cards - how did you do?? Did you guess that this was my card. Don't feel bad ... I'm not sure I could have guessed that this was my card!! How about that AWESOME magic keyword game?? I have just been amazed at the cleverness and the amazing quality of the pictures that Heather has found! It's been so much fun to play along!! A*Muse*A*Palooza is so close ... I can hardly wait!! Did you see this post about the A*Muse*A*Palooza kit, just for us poor souls that don't have a store close by! So exciting! 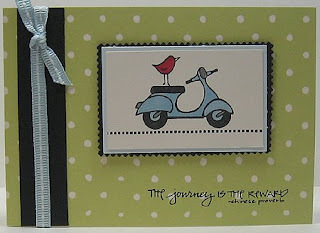 Details: Note card, paper, ribbon, stamps by A Muse, colored with Copics and Spicas. First of all - I just have to say a BIG THANKS to everyone who played along with my Sketch Challenge on the A*Muse*A*Palooza blog! I was absolutely amazed by what everyone created! So thank you, thank you, thank you! 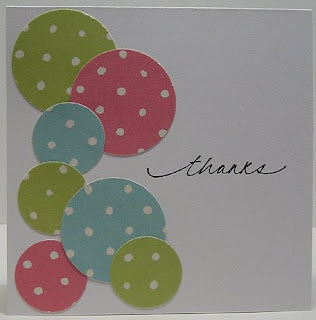 And congrats to Tracy Clemente and EMNKKSMOMMY - the lucky winners of a pack of blue Maderia Note cards and one of my favorite stamps - "A true friend is the greatest of all blessings"! There are still a few challenges and games left - so remember - you can't win if you don't play - and you can't win if you aren't registered! Go HERE to register! On to the challenge of the moment!! 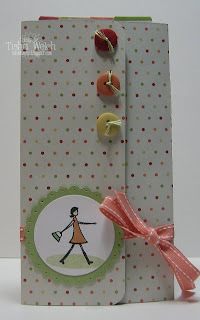 Michelle Clark is hostessing an awesome challenge involving polka dots! How could you go wrong? You can read all the details HERE!! 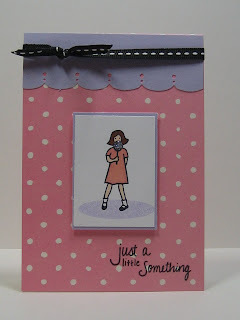 This is such a fun challenge -I'm sure there will be lots of awesome cards to check out in the SCS gallery HERE! My card is the ultimate in simplicity - and probably not the most original thought in the world, but it works and I like it!! 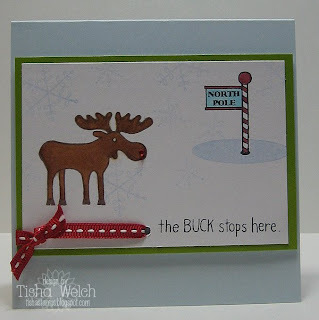 I just went looking for the inspiration, and I think it must have come from the second card in this post by guest designer Dawn McVey, among others! Thanks Dawn! Details: Stamp, papers by A Muse, punches by EK Success, Marvy.